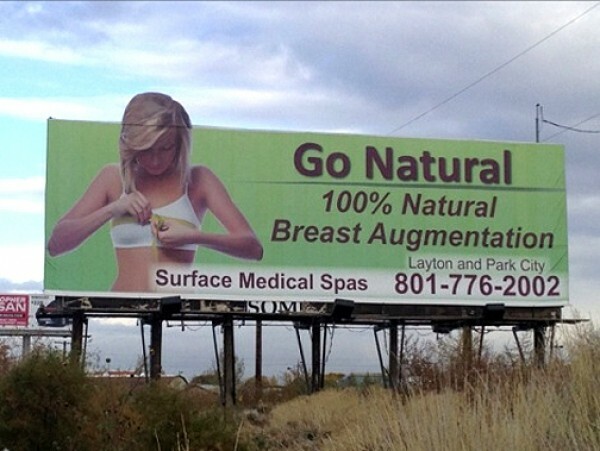 If you’ve found yourself curious about a procedure advertised on billboards as “natural breast augmentation,” the good news is that it’s an actual, well-established medical procedure. The bad news ... is hard to find. The procedure, from a cosmetic standpoint and when done properly, seems like a win-win: Fat is liposuctioned from one area of the body and then implanted into the breast as a natural enhancement. But doctors disagree. The transfer of fat from one part of the body to another sometimes requires multiple procedures over time, as grafted fat can simply dissolve. More concerning for doctors and physicians, however, is the fact that when transferred, some fat can undergo necrosis—essentially dying in the graft before calcifying and hardening. And during a breast examination, the hardened lump can easily be misdiagnosed as breast cancer. And finding objective information about natural breast augmentation is not an easy task. A simple Internet search for the term “natural breast augmentation” is typically filled with pages full of testimonials and positive articles from clinics that provide the operation, touting it as a safer, more natural alternative to traditional breast-enhancement surgery. Dr. Jayant Agarwal, an associate professor of surgery at the plastic-surgery division of the University of Utah School of Medicine, says that though the procedure is now a cosmetic option, it’s traditionally been used for breast reconstruction for women who had undergone mastectomies, but complications arise even then. If the transferred fat doesn’t grow—or “revasculate”—the vessels, then “those areas of fat will die, and you get oily cysts; you get hardened areas of scar tissues and calcification because the fat has died,” Agarwal says. These hardened lumps aren’t dangerous on their own, but they can increase the chance that when a woman is screened for breast cancer, the lumps will be mistaken for being carcinogenic and require a biopsy. In seeking to understand the procedure, City Weekly also called the clinic and asked a customer-service staffer about side effects. Agarwal says it can be more of a common problem, but he also believes that improvements in screening in the future will make it easier, through MRIs and ultrasounds, to discern dead fat from cancerous lumps, eventually making it less likely women will need to get unnecessary biopsies. Barson says that he’s aware of the problem in general, but he’s never heard of it being a problem with one of his clients. He says that all complications and concerns are explained to patients in detail before they sign a consent form. And despite these complications, Barson says, fat itself is not dangerous. “Fat is not cancer; there’s nothing really nefarious about fat,” he says. Agerwal says that there are other side effects that women should take into consideration. Liposuction presents its own host of complications, he says, and since fat transferred to the breast is fat, and not an implant, it can easily dissolve, requiring repeat procedures that make natural breast augmentation much more costly than traditional breast enhancements. Barson, however, argues that depending on how one views it, the procedure is more economical because it also includes liposuction. Agarwal says he is indifferent about the procedure and simply recommends caution. *Editor's Note: This story has been updated from the print edition, which incorrectly stated that Surface Medical Spa's website had been changed after City Weekly contacted the clinic.